With the opening of Claypots Full Circle at Amoy Street in Singapore, The Claypots Group in Australia has indeed come in full circle. This seafood restaurant and bar, at its core, serves up dishes influenced by Mediterranean and Asian flavours. Interestingly, you will be surprised to know that Singapore cuisine plays a huge part in it as well. Founded by self-taught Mediterranean chef Renan Goksin, it all began when Chef Renan travelled to the South East Asia region and was captivated by our sambal stingray and chilli crab. He is particularly intrigued by the use of claypots in our dishes, which is similar to the clay earthenware pots used in Mediterranean cooking that he was familiar with. 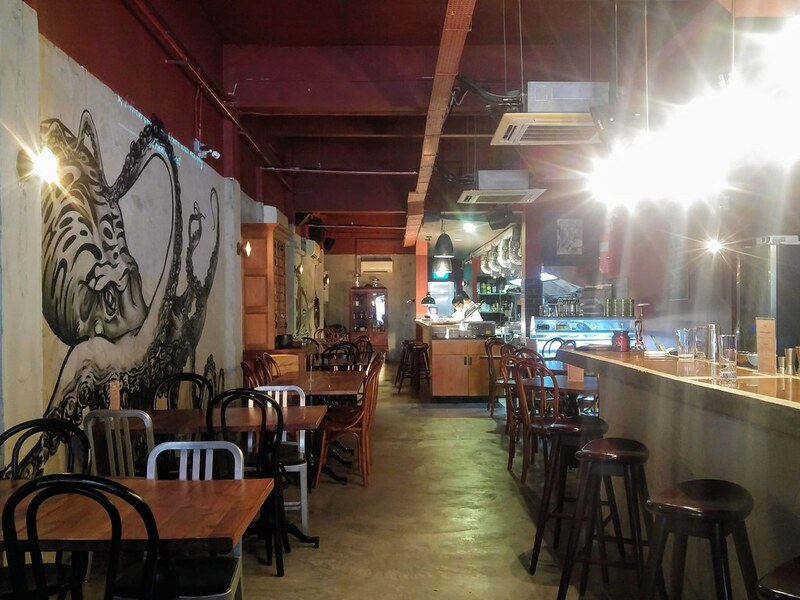 Taking inspiration from it, Claypots Australia was then established to be known for its seafood dishes with bold flavours and served in claypots. Then two Singaporeans fell in love with its seafood dishes during their stint in Melbourne as university students, which eventually led to their collaboration and establishment of Claypots' first overseas outpost. In Singapore, you get to enjoy exclusive items such as Okra tossed with Dried Shrimp ($7) as well as the Cheese Saganaki ($15). The in-house dried shrimp paste was robust but I find the dish rather ordinary. On the other hand, the Cheese Saganaki sent much joy down to my belly as I took in the sweet, piquant, savoury flavours of the dish. 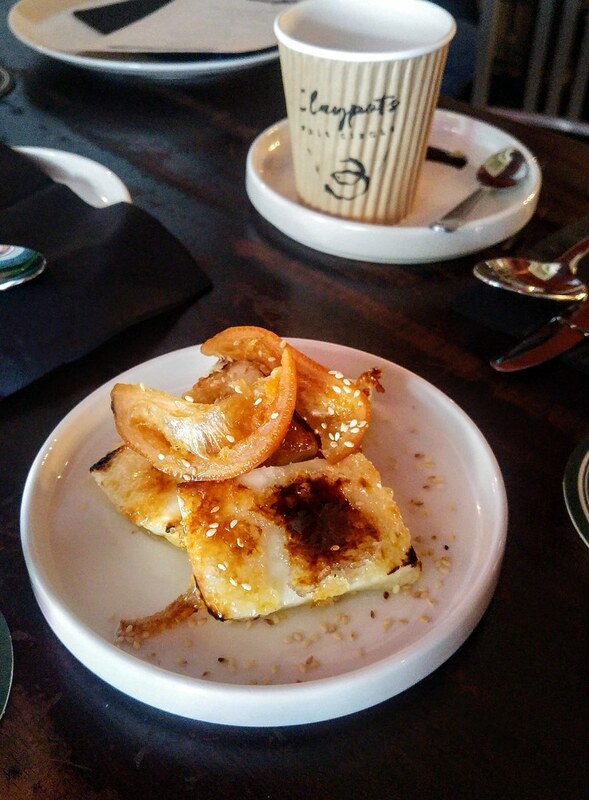 Oven baked and caramelized with sugar, the Haloumi cheese takes on a whole new profile with its sugary crust. I love the candied orange that gives a concentrated amount of zest to the cheese while at the same time brightening the dish visually. 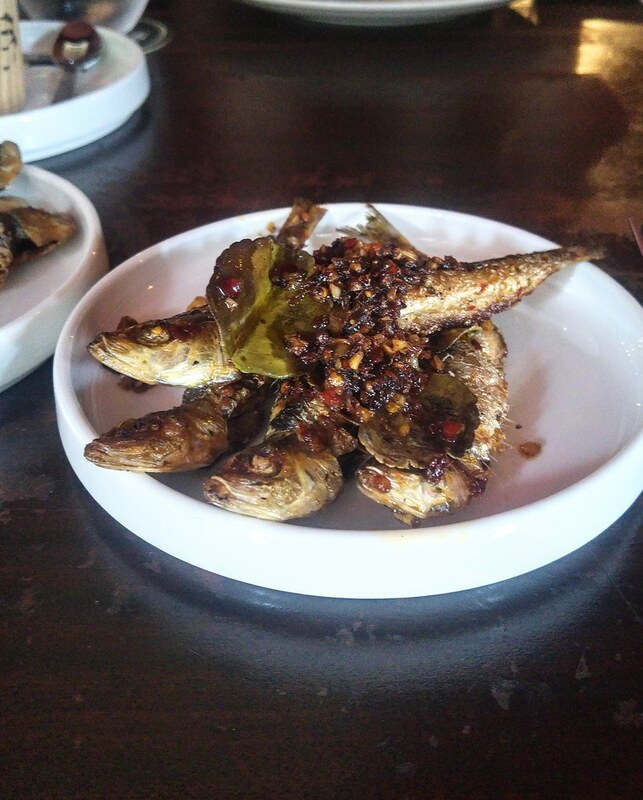 Showcasing our South East Asian flavours is the Grilled Atlantic Sardines with Kaffir Lime Leaves ($10 ). Not your typical canned sardines but specially imported fresh sardines. 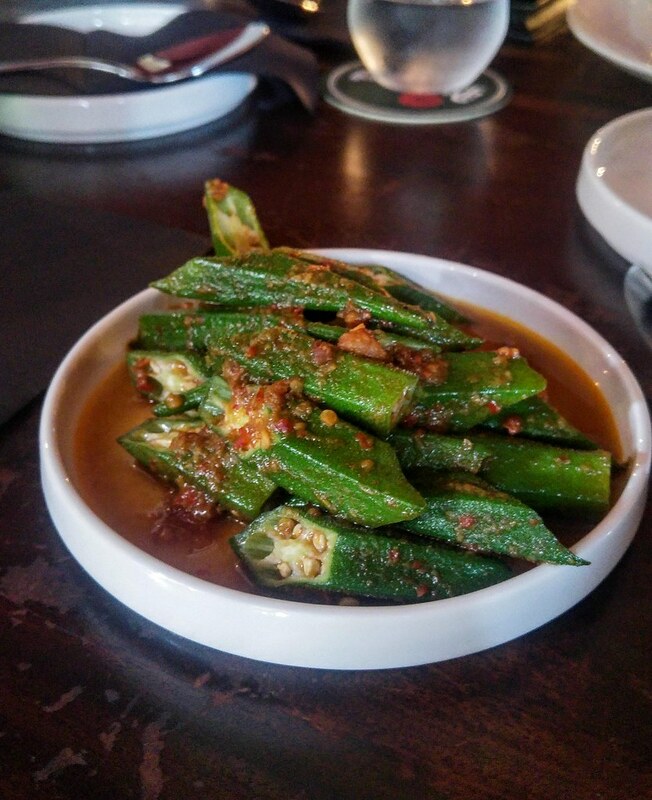 The highlight of this small plate is the sweet, tingling spicy sambal paste served atop. It goes really well with the rich, dense meat and addictive along the way. Experience an extra large Garlic Prawn (Market Price), which is usually a Tiger, Banana or Indian White Prawn. 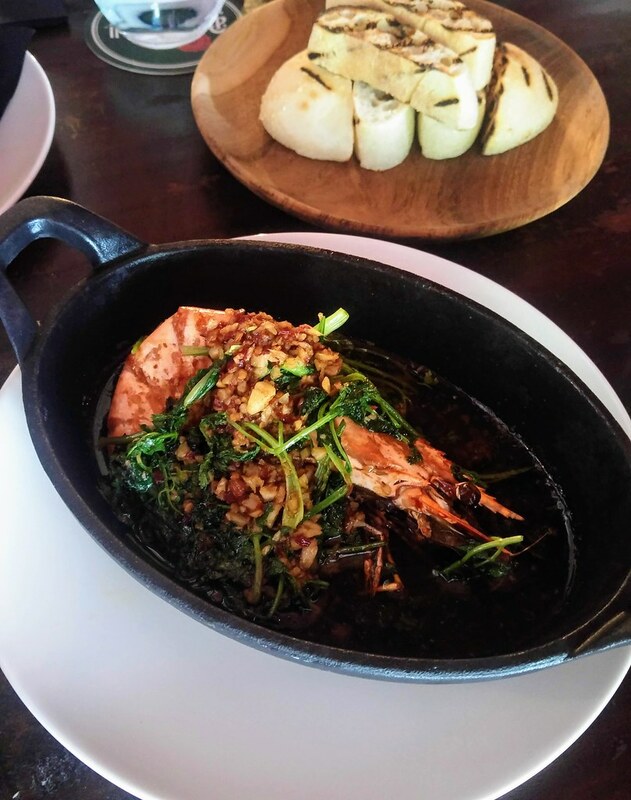 What we had was the Tiger Prawn which came sizzling in its own juices with olive oil and garlic in a hot plate. There is a reason why Pide is served along with it, as you simply can't help but to use it and sop up the garlicky oil, flavoured with the goodness of the crustacean juice. And please don't mistaken the seared coriander as a garnish! It is be savoured alongside the prawn for a complete satisfaction. 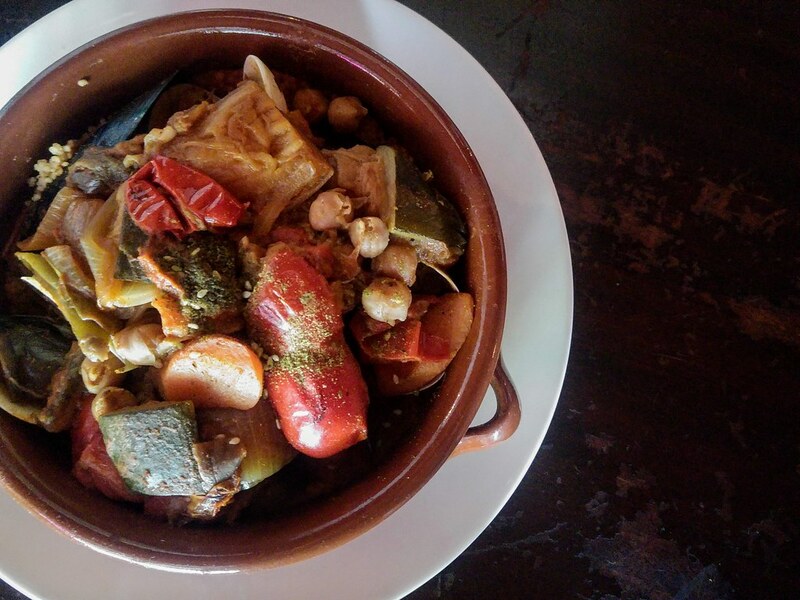 Afterall all the rich, garlicky and spicy stimulation, Moroccan Claypot ($26) was extra comforting on my senses. 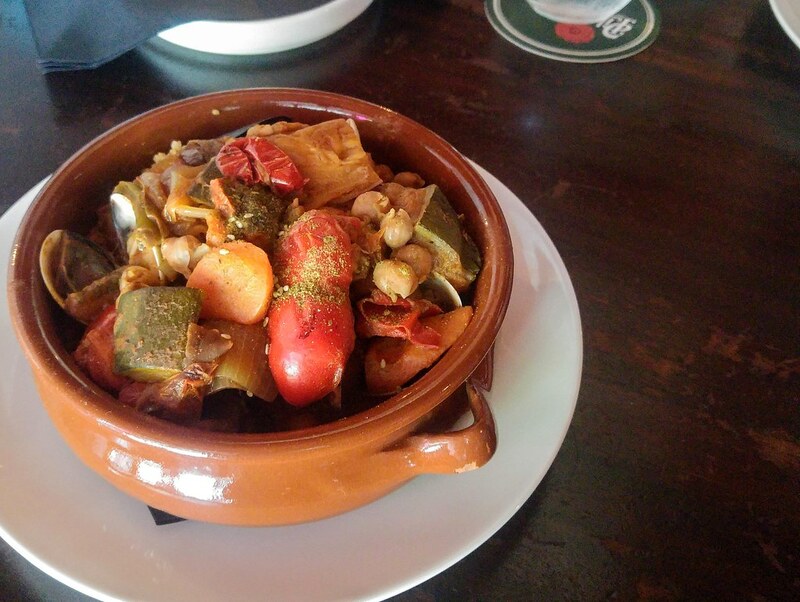 The pot houses fish fillets, mussels and clams, prepared with an aromatic herb and spiced tomato based sauce, sweetened with vegetables such as roasted peppers, eggplants and zucchini that are well cooked down to release all their sweet juices. Stirring it up and you will find a bed of cous cous at the bottom, flavourful with all the mixture of herbs, spices, sauces and juices. 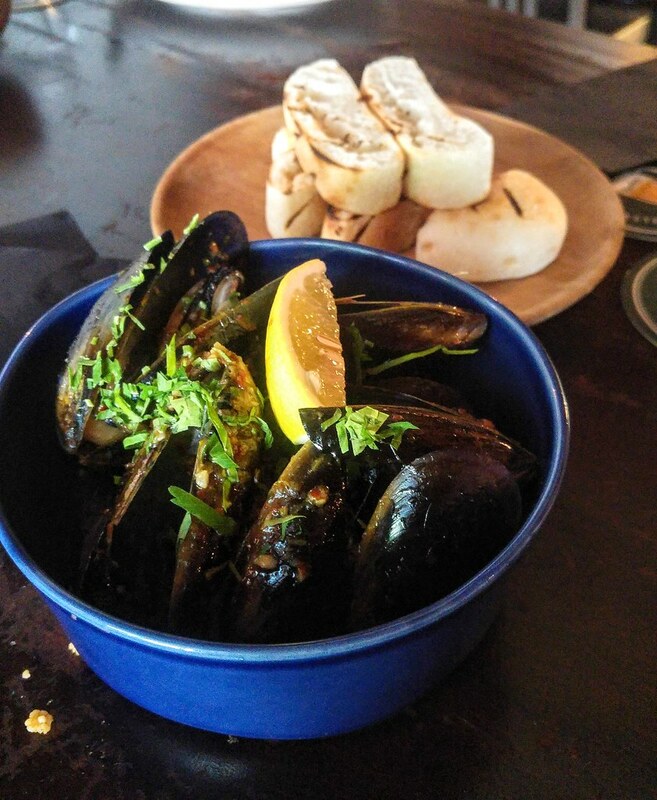 One of Claypots' signature sharing plate is this Full Circle Port Arlington Mussels ($25) in a garlic and herb mix. The mussels were elegant and delicate. The sauce is again, spicy and garlicky, like a diluted version of their homemade sambal paste. I would prefer the sauce to be simply wine and butter with garlic and herbs, as the spices start to get a little overwhelming after a few dishes. 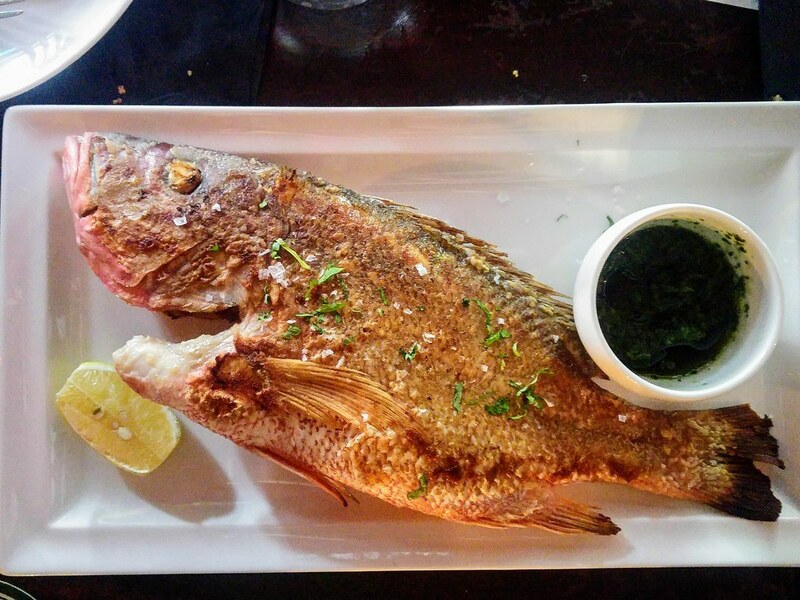 Our 'Fish of the Day' (Market Price) was Red Snapper. Very lightly seasoned, a specially made Chermoula, a Tunisian sauce traditionally used to pair with seafood was served alongside to complement the fresh meat. Any more 'sambal' would have ruin the meat for sure. As a finale, we had their signature St Kilda Shellfish Stir-Fry (Market Price). 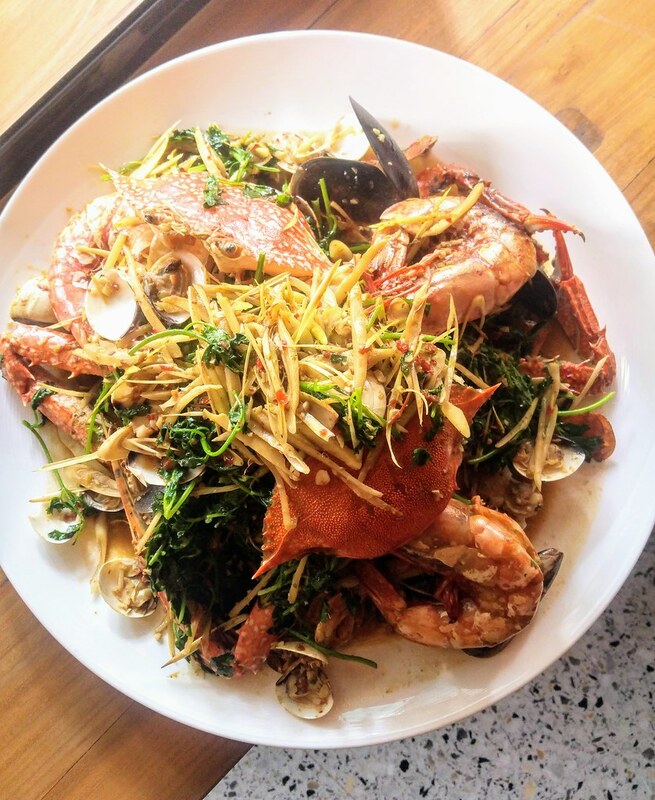 It is a blackboard special that came in a visually astounding serving of seafood stacked together including flower crab, mussels, clams and prawns, tossed in coriander, lemongrass and spices in a wok. I love the rice, which were plumped with juices and its spicy house gravy from the ingredients. I also adores the coriander and ginger that comes along in the dish. Like many, I thought Claypots Full Circle was a claypots dining concept initially. It is essentially a seafood dining bar but its identity may be more striking if there are more dishes served in claypots. That said, I appreciate how it celebrates our South East Asian flavours and dishes by serving up really solid housemade sambal. 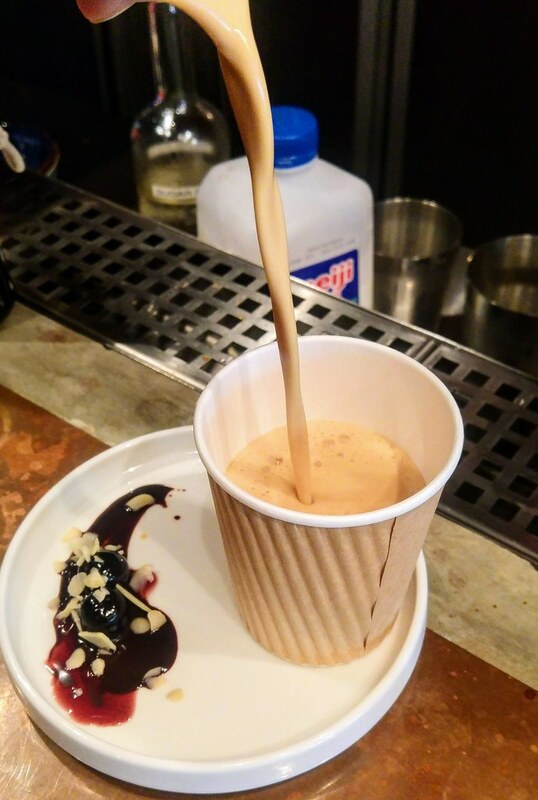 Do grab a cup of 'Coffee' when you are here, concocted with Bourbon, Frangelico liqueur, Expresso, milk and Maraschino cherry syrup. It goes really well with the punchy flavours of the dishes, and the bonus is that you can easily sneak a cup into your office cubicle!